Facing trials and tribulations in life is the tragedy that we live for! Despite the hard work in education, business, and job when one can’t enjoy its fruits, depression and mental agony comes naturally. For the sole purpose of uplifting such souls and getting them the results of their hard labour, the Sarv Karya Siddhi Yantra is installed. Having proven its mettle in harbingering success and fulfilling the heart’s desires, the Yantra is a one of a kind. 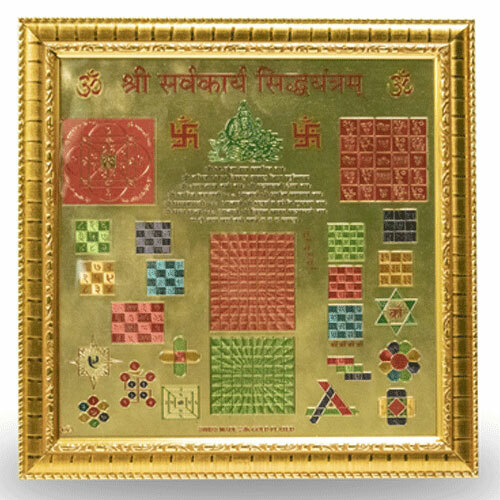 Being made up of 7 equal parts and into a chakra, the Sarv Karya Siddhi Yantra has to be worshipped regularly for better results. After taking a bath, proffer yellow sandalwood to the Yantra, and worship it with proper Mantra and chants. It has to be kept in mind that the Yantra must be worshipped on Wednesdays, positively.